There are clear reports that cheque fraud losses are diminishing, largely due to the success of improved fraudulent cheque detection methods and enhanced prevention controls. Plus the industry is tackling fraud through information sharing, technological advances, and banks are using an increasingly sophisticated fraud screening detection tools too. It goes without saying that your cheques are produced to C&CCC standards, but can you do more to enhance security? Adding security holograms to your cheques sends a bold warning to discourage cheque fraud. No well produced hologram can be accurately replicated so as to escape the security of a trained eye. 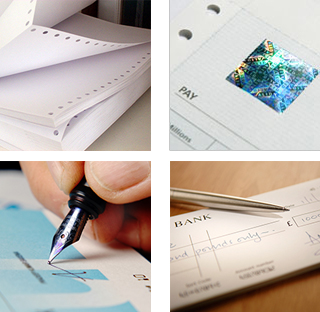 Here at Corinium Continous we can add holograms and enhanced security features to your cheques. Not all C&CCC accredited printers have the capacity to do this, nor the expert experience in advising customers as to how best protect their cheques against fraud. Our hologram application processes and designs meet all UK requirements. Holograms are used extensively on high security applications such as passports, banknotes, ID cards and financial cards, as well as on tickets, vouchers and certificates. Holograms and enhanced security features also enhance your company’s brand. You are shouting out that you operate within best practice, and take fraud seriously. Take a look at our sample marketing cheque and security features explanatory leaflet. Next time you place an order for cheques you might like to consider holograms (and other security features) as a valuable addition. We would be delighted to provide you with our expert advice together with a a no obligation quote, letting you know the difference in price, and we think you may be pleasantly surprised.